Rain is good thing! We need it. We pray for it. We fight over it. We stress over it. We pull our hair out over it. But it also has consequences. Some good, some bad. I know plenty of cherry farmers weren't very happy with last weekend's rain. Cherries are gearing up to be harvested in our area and getting ready for market, rain can really put a wrench in those plans when it is unexpected and there is nothing that can be done. But in all honesty, we need rain in the Central Valley. We will take it whenever it comes. We waited all winter for the floods of El Nino that were expected. But of course, this winter brought no dramatic increase in rain and in the Central Valley we are still below our average rainfall for the year. Granted we haven't achieved that average in some time, it would be nice to get it again soon. So in the mean time we took the early April showers with a thankful smile and an appreciation of any water at all. With rain, usually comes a heavy wind. Especially in the desert region that we farm in the Southern Central Valley. When it is raining or storming in the Northern or Central parts of the San Joaquin Valley, we are generally met with a dust storm or heavy winds with little to no rainfall due to our infamous ran shadow effect. When there is a forecast for rain, we don't get our hopes up, it usually doesn't show up. So, 10 days ago when they predicted a small rainfall, I wasn't expecting much. Much to my surprise we received 1.4 inches of rain in 3 days at our house. Some parts of Bakersfield received 2 inches or more and others less than an inch. To a region of the state where our average rainfall is around 6 inches in a normal year, we were shocked to get this much in an average year in the midst of a multiyear drought. What happens to a drought stricken flat valley when they do finally get rain? Well, I am sure you can guess it. We flood, we loose trees and we have crop damage. 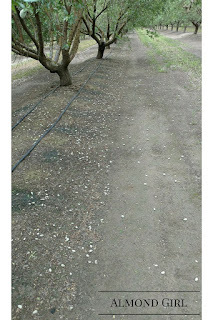 Our orchards had standing water puddles a few rows in, with access roads and ditches had water flowing like a river. 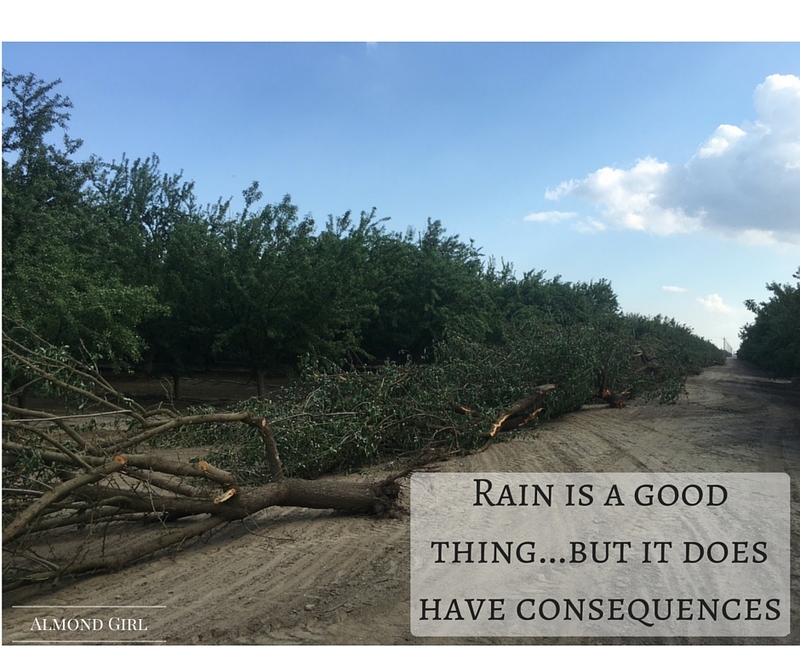 Some of our shallow rooted almond trees couldn't withstand the wind and drenched root zones. We lost about 100 of our mature almonds trees. Half of that was in an old orchard that will possibly be removed after harvest this year anyways. We also have an almond crop that fell off the tree from the heavy wind, whipping the nuts and rubbing them off. This crop was most likely not viable anyways and would have fallen off before harvest naturally. Needless to say, we spent last week cleaning up the fields and pulling fallen trees out of the orchard. It may seem like a disaster to some, and some farmers always have it worse than others. But rain is a good thing. We are grateful for the rain we received and wish we received more of it. At the end of the day, Central Valley farmers aren't going to receive any more water from the State or Federal projects so we have to be thankful for the rain. Rain not only helps to irrigate the crop right now, it helps to recharge our groundwater basin, add some water to reservoirs, and most importantly it generally comes with snow in the mountains. So keep praying for rain!